Mankind is certainly creative at coming up with ways to minimize, justify, and excuse sin. Adam even tried to blame his sin on God, saying, “The woman whom YOU gave to be with me…” (Genesis 3:12). 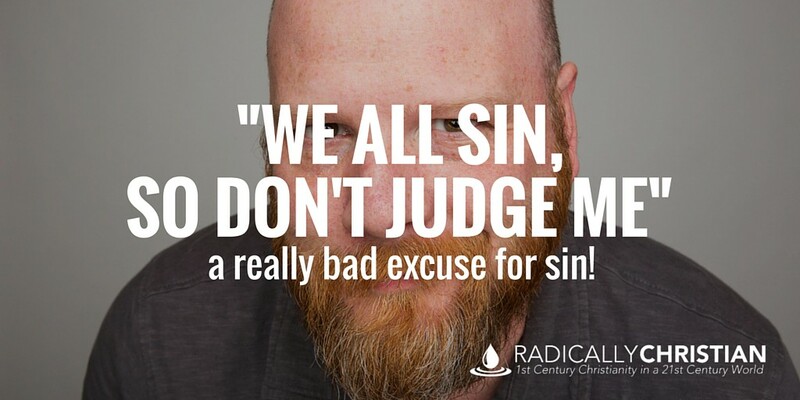 That’s a pretty bad excuse, but it’s probably not any worse than the excuse we hear so often today, “We all sin, so don’t judge me!” Here are a few reasons that is a really bad excuse for sin. When people say, “We all sin,” they have not denied that their behavior is indeed sinful; they are simply trying to minimize the significance of their sin by spreading the blame around. In fact, it would appear they are actually admitting to their sin. That, in and of itself, is a judgement. Calling anything “sin” is making a judgement. In fact, they are not only judging their own behavior as “sin,” they are judging other’s behavior as “sin” as well. Essentially they are saying, “You’re not allowed to judge me as having sinned, because I have already judged you as having sinned.” Isn’t that a glaring double standard? The problem is that when I am trying to get someone to recognize the sinfulness of a particular behavior, it has nothing to do with my sin. This is an objective question, “Is it a sin to do this?” Whether or not I have sinned has absolutely nothing to do with it. But while we are on the subject, YES, I have sinned! I have sinned horribly. I readily and freely admit it. Furthermore, all people have sinned (Romans 3:23) and John warns, “If we say we have no sin, we deceive ourselves, and the truth is not in us” (1 John 1:8). But when people say, “We all sin,” they are often trying to justify continuing in a particular behavior. And that is the problem! Yes, we all sin; the difference is that some people have repented and others are determined to continue in sin. “What shall we say then? Are we to continue in sin that grace may abound? By no means! How can we who died to sin still live in it? Do you not know that all of us who have been baptized into Christ Jesus were baptized into his death? We were buried therefore with him by baptism into death, in order that, just as Christ was raised from the dead by the glory of the Father, we too might walk in newness of life” (Romans 6:1-4). Yes we all sin, but if any of us decide to continue in sin, we forfeit the forgiveness Jesus came to bring us. As the writer of Hebrews said, “For if we go on sinning deliberately after receiving the knowledge of the truth, there no longer remains a sacrifice for sins, but a fearful expectation of judgment” (Hebrews 10:26-27). So let’s stop trying to minimize, justify, and excuse our sin. Instead, let’s allow the grace of God to train us “to renounce ungodliness and worldly passions, and to live self-controlled, upright, and godly lives in the present age” (Titus 2:12).